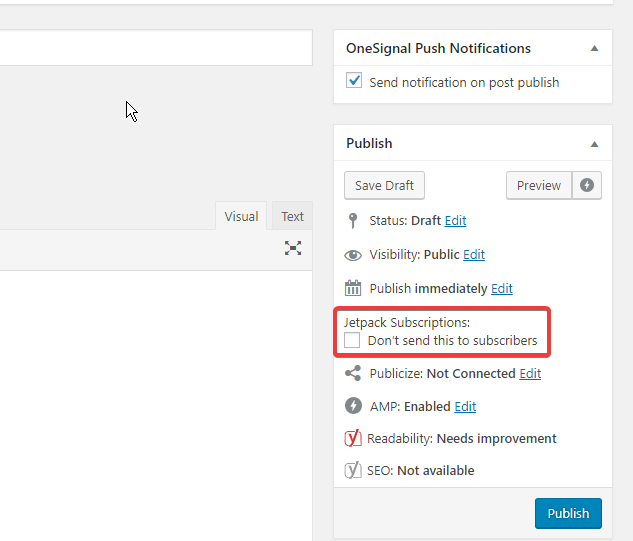 * Filter whether or not to show the per-post subscription option. * @param bool true = show checkbox option on all new posts | false = hide the option. // only show checkbox if post hasn't been published and is a 'post' post type. To be clear the current behavior for those who have this filter installed and updated to 5.0 is that dont_email_post_to_subs=1 and their emails will not send, correct? @bikedorkjon Yes, that is correct. I would recommend removing the filter in those cases. Hi! Has someone found a solution for this issue? Forgive me my stupidity (and google isn't helping either), where are those #####-zen tickets referring to? Tried to get some more information on the matter, but where can I find these reports? Hi @USRFSledge; those are references to reports relating to the issue at hand that have come through our (other) support channels. You won't have access to view these, but they wouldn't contain any new information either, so you're not missing out on anything. Thank you for the clarification @jeremypaavola . Now it make sense I couldn't find anything about them on google. I'll be monitoring this thread, as I really prefer to have this option back again. User in 1877078-zen wants us to notify them once issue is fixed, and specifically asked us to keep their ticket open. Placing their ticket on an indefinite hold, so we stop sending reminder/CSAT emails. I closed 1877078-zen so we don't have to keep dealing with it in Play mode. The user won't be notified or asked for CSAT. If they write back in a follow-up will be created. Similarly, when we need to follow-up with them, we can create a follow-up easily from that closed ticket.